The 3003A Single System consists of a weighing platform with a dedicated digital readout. Its heavy-duty construction is designed for day-in, day-out weight monitoring. Rotating casters facilitate moving and cleaning beneath the weighing platform. Line cord power provides continuous readings in kilos to 100 gm accuracy. A central station is available for monitoring up to 8 platforms. The 3003T system has the same features and advantages as the 3003A, except the twin system monitors two patients with one dual readout at a lower cost per station. For continuous weight monitoring of one or two patients with single readout. 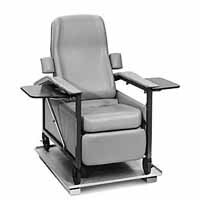 Accurate weights regardless of patient's position, or chair configuration. 3003A Consists of - 1 Weighing Platform. 1 Dedicated Readout. 3003T Consists of - 2 Weighing Platforms. 1 Dual Readout. Weighing Range (patient) - 200 kg. Readout - Digital LED display in kilograms (pounds available). Platform - 35" X 35" X 2" high with casters. Accommodates all chairs. Power Source - 110 VAC line cord. Weighing Mechanism - Electronic load cells.